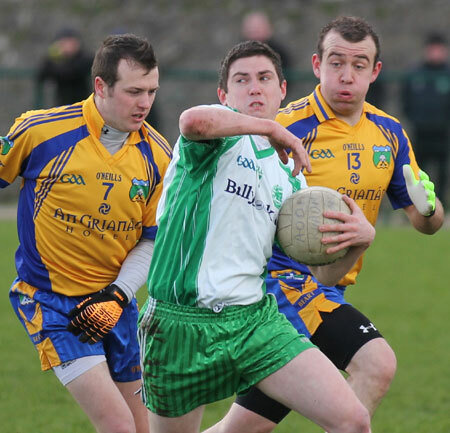 A draw was enough to see Aodh Ruadh set-up a promotion play-off with neighbours Naomh Br�d. 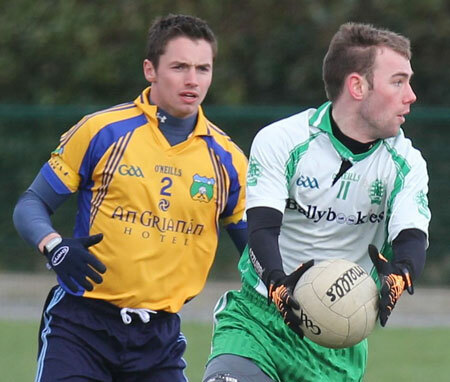 That tie has added spice with the sides also due to face-off in the first round of the intermediate championship. 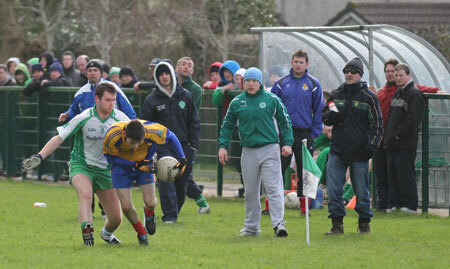 Conditions were cool, bright and dry in Ballyshannon, but there was a swirling breeze which made shooting tricky. 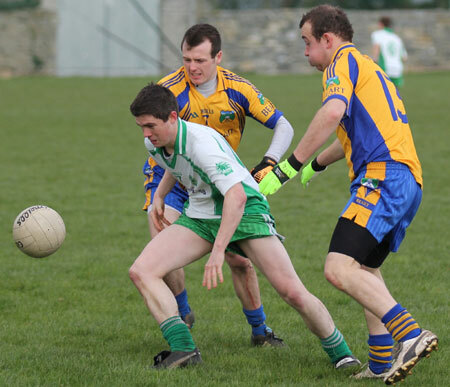 Aodh Ruadh were first off the mark two minutes in when Peter Boyle, beginning his first senior game for Ballyshannon out the pitch, set up Michael 'Sticky' Ward who had to use all his considerable technique to screw the ball over the bar. 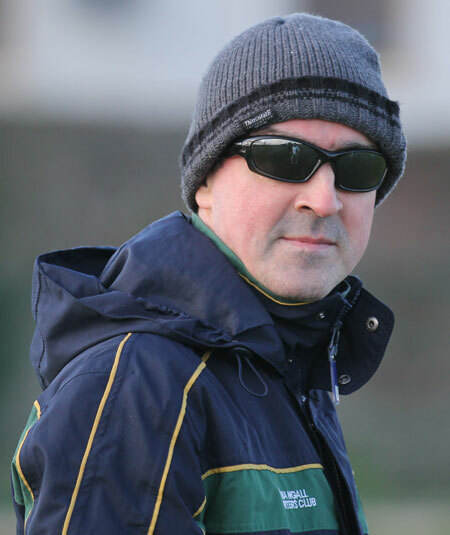 David Dolan's free-taking off the left is one of Aodh Ruadh's greatest assets and two from him had the homesters three to the good after 12 minutes. 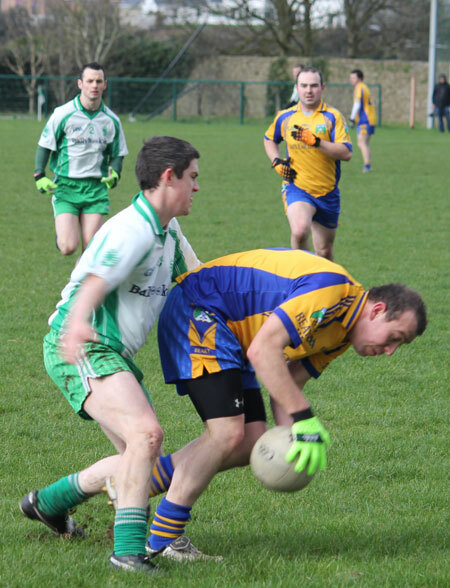 Aodh Ruadh enjoyed early dominance at midfield and their hunger on the break ball saw them with the lion's share of possession. 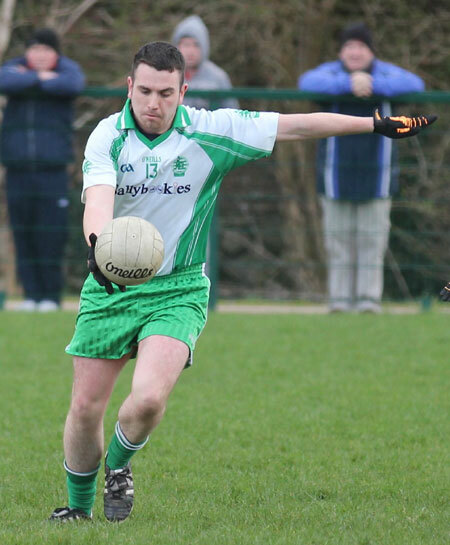 Some intelligent recycling of the ball saw Diarm�id McInerney finish with one of his trademark over the shoulder points to leave Aodh Ruadh leading four points to no score at the end of the first quarter. It took impressive midfielder Ciaran Dowds to get Burt off the mark with a long range free after 21 minutes. 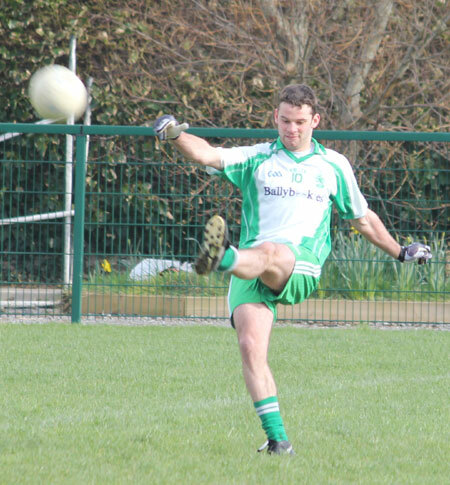 Aodh Ruadh went searching for a reply and got one courtesy of another David Dolan free on 23 minutes, atoning for a miss moments earlier. 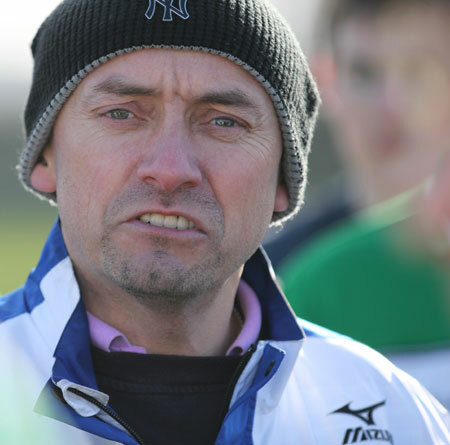 Ballyshannon tired a little in the closing stages of the first half and Burt were able to claw back some ground before the break. 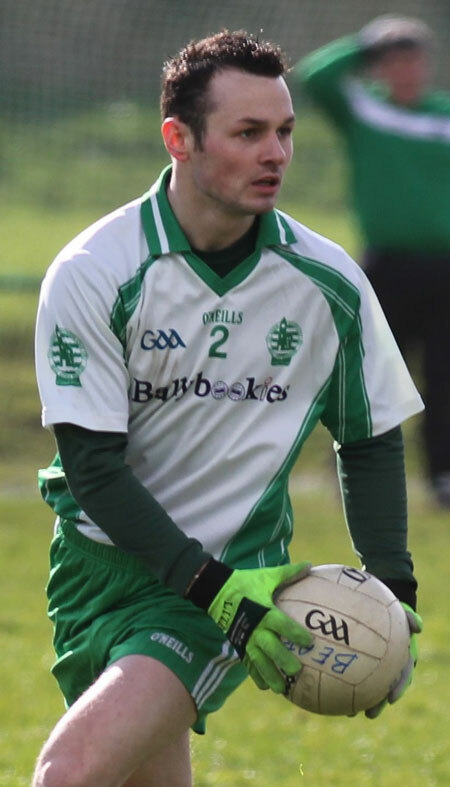 First Stephen Gillespie broke through the Aodh Ruadh defensive cover and had the sniff of a goal on, however his shot flashed over the crossbar. 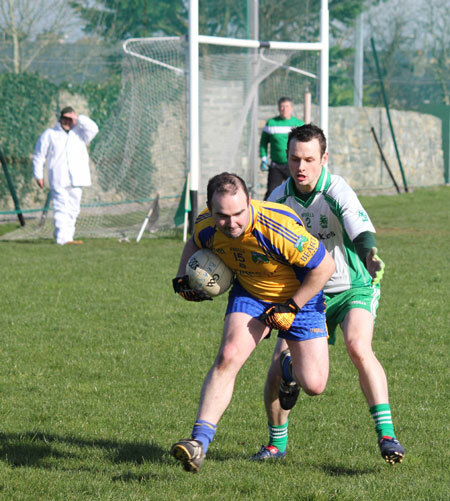 Then two minutes into added time Ciaran Dowds defied the breeze to hit a superb long range point to make the half time score Aodh Ruadh 0-5 Burt 0-2. 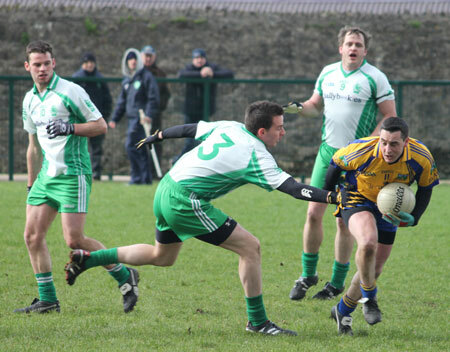 Burt closed the gap further on the resumption with a fine from Shane McDaid, again making light work of the swirling wind. 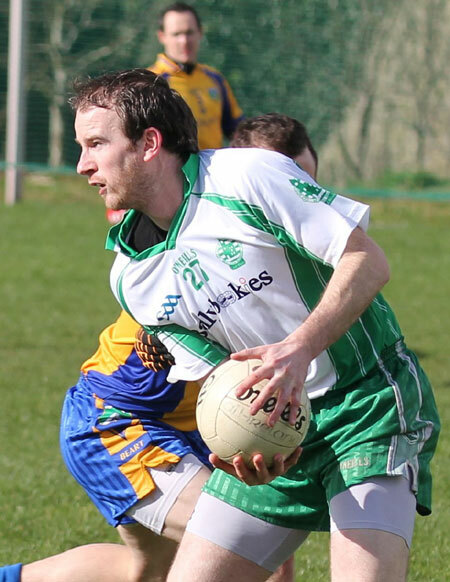 Aodh Ruadh restored the two point gap thanks to tenacious work from David Dolan. 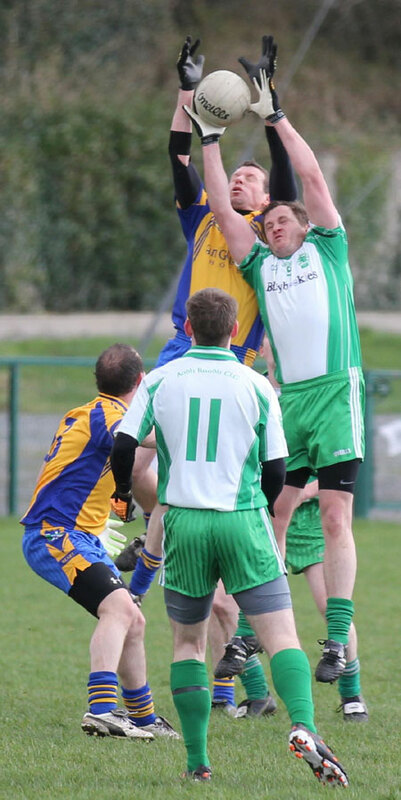 He fed Donagh McIntyre and his lofted shot slipped inside the post. 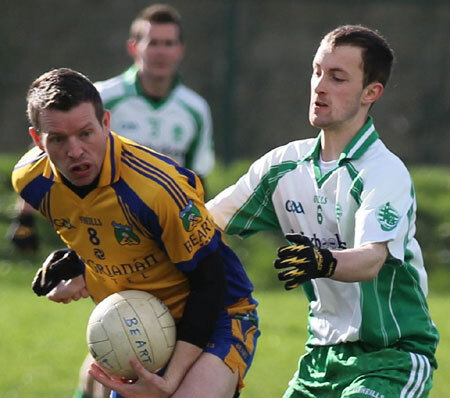 As the game went into the final quarter the Inishowen men cut the deficit to the minimum. 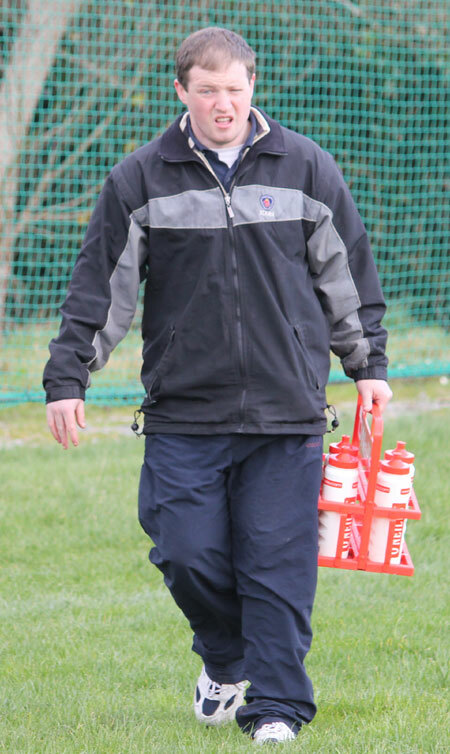 Ciaran Dowds once again playing a leadership role, this time driving over another fine long range point. Burt enjoyed most of the possession in the second half, however rash shooting saw them squander many chances and running up 15 wides. Ironically it was Joe Boyle, Burt's biggest offender on the wide count, who leveled the game. 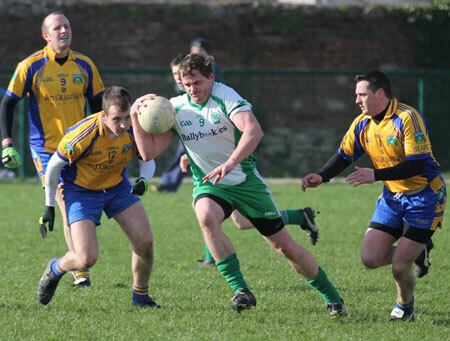 And what a leveler it was, swiveling the ball over the bar from a sideline ball. 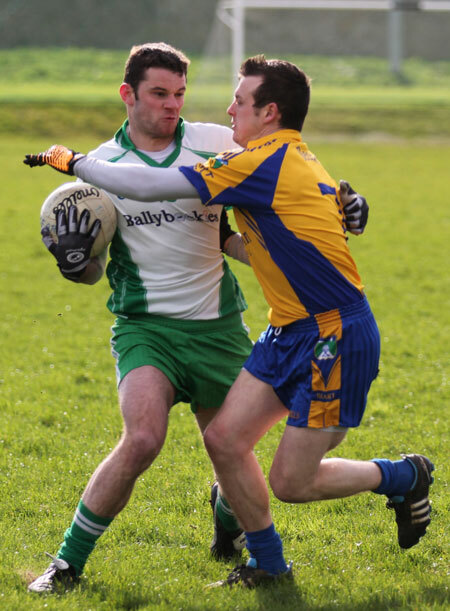 Ballyshannon fashioned an immediate response this time PJ McGee, in his first game as captain, riding the tackles to set up Kieran Keown. The half-time sub showed great composure to take his score with 13 minutes of normal time remaining. The closing stages were evenly disputed, but neither side could make an impression on the scoreboard. 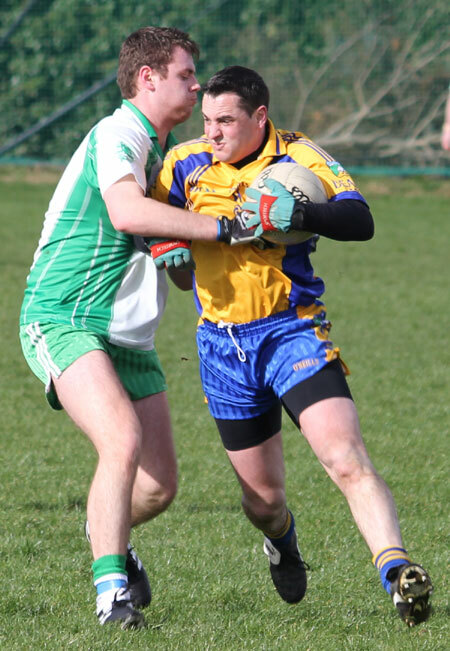 Fittingly it was man of the match Ciaran Dowds who had the last word on the stroke of full time, slicing over a close range point from a difficult angle to level the match. Jimmy White blew for time shortly after. 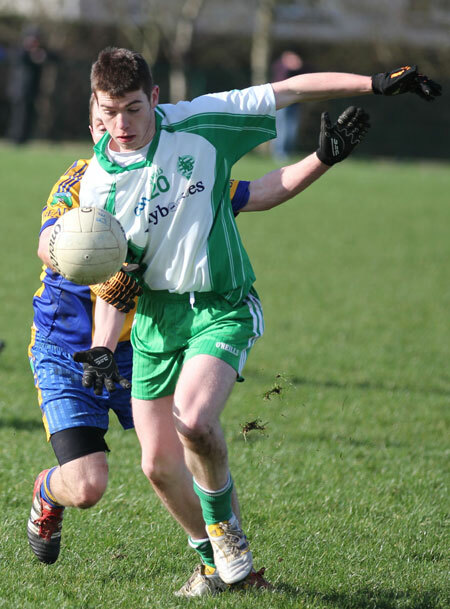 There was encouragement for Aodh Ruadh in a solid team display. 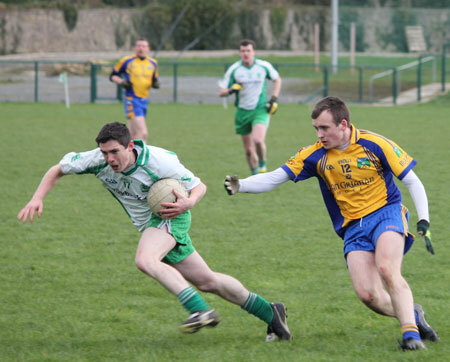 Ciron Whoriskey was magisterial at full back while Ronan Drummond had an excellent first half at centre half back in his first senior game for Aodh Ruadh. 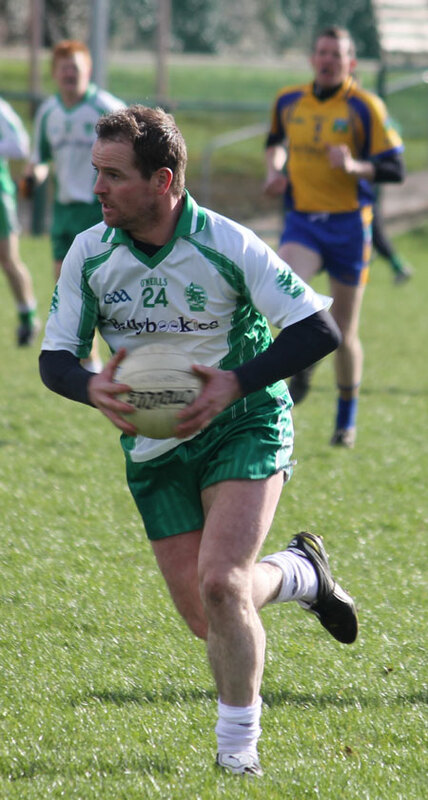 PJ McGee responded well to being given captaincy, while Donagh McIntyre, looking trim and businesslike, had a fine 60 minutes. David Dolan was very polished and Anthony Boyle did a lot of useful foraging. 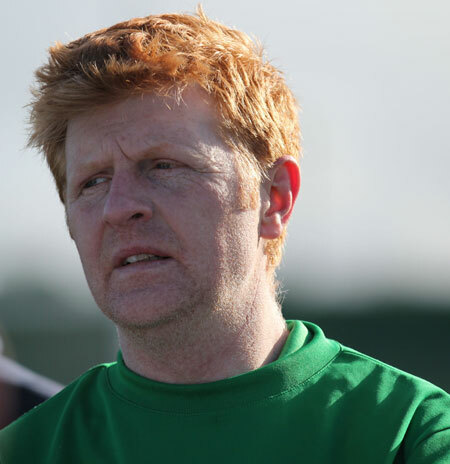 Another plus for the homesters was the positive impact made by the substitutes. 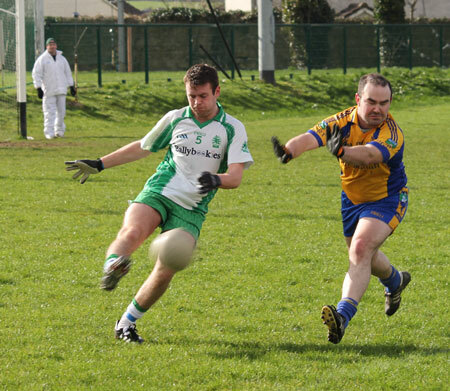 Ryan Granaghan caught the eye with a few calm and intelligent touches as time ran out for Burt to get the winner. 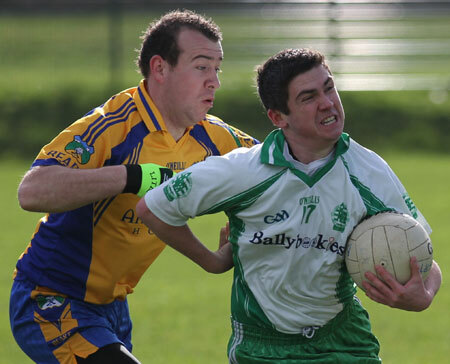 Burt battled manfully, but their shooting let them down, 15 wides to Aodh Ruadh's telling its own story. 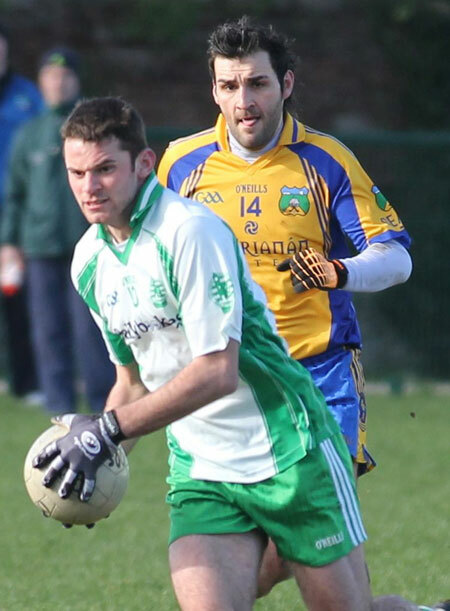 Ciaran Dowds deserves man of the match for the leadership he displayed, his fine scoring and the way he took control at midfield as the game wore on. 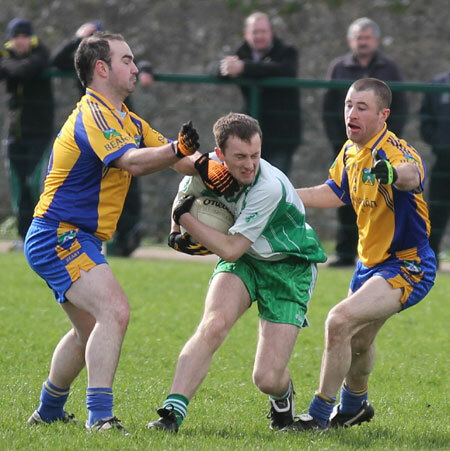 It wasn't enough for Burt though and it will be between Aodh Ruadh and Naomh Br�d next Sunday to determine who joins Naomh Mhuire in division two for 2012. 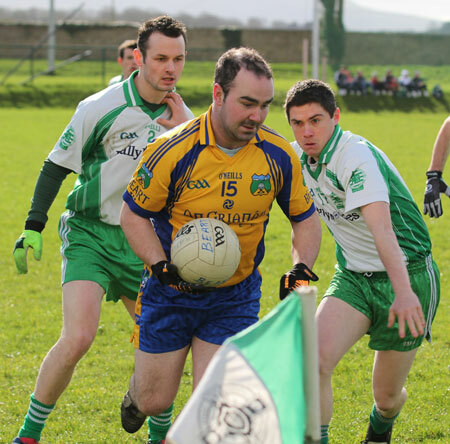 Paul Kane; David Finnerty, Ciron Whoriskey, Michael Dolan; Ronan McGurrin, Ronan Drummond, PJ McGee; Kerry Ryan, James O'Donnell; David Dolan (0-3f), Peter Boyle, Donagh McIntyre (0-1); Diarmaid McInerney (0-1), Michael 'Sticky' Ward (0-1), Anthony Boyle. 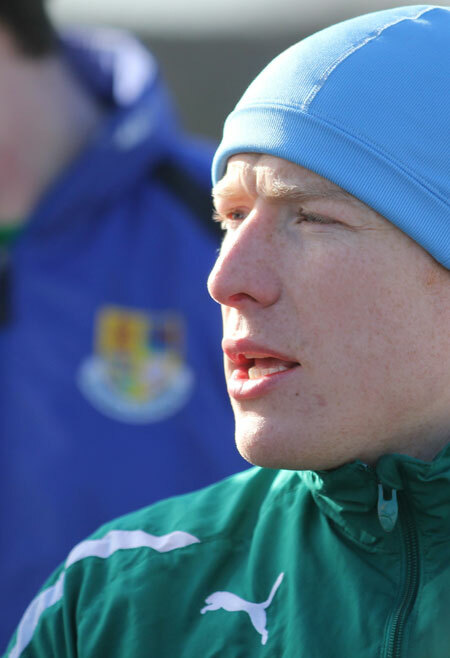 Substitutes: Kieran Keown (0-1) for Ronan McGurrin: half-time; Steven Perry for Peter Boyle: 47 minutes; Pauric Loughlin for Kerry Ryan: 49 minutes; Ryan Granaghan for Diarmaid McInerney: 55 minutes; Johnny Gethins, Ronan Matthews, Michael Ward, Matthew Thompson, Turlough McIntyre. Yellow card: Michael 'Sticky' Ward, 57 minutes. 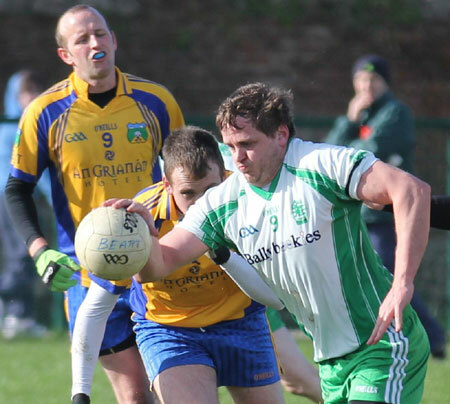 Kevin McDermott; Brendan Harrigan, Mark McGavigan, Jonathan Downey; Paul McHugh, Martin Donaghy, Seamus O'Donnell; Ciaran Dowds (0-4, 1f), Patrick McDermott; Rory Grant, Michael McCann, Stephen Gillespie (0-1); Kevin Glenn, Joe Boyle (0-1f), Shane McDaid (0-1f). 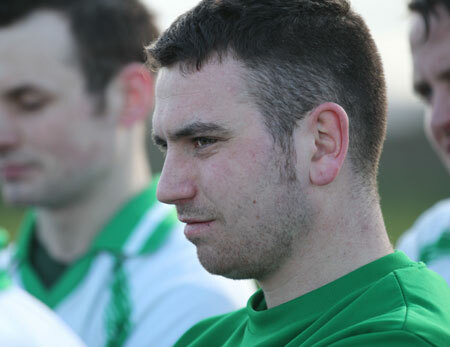 Substitutes: Christopher McDermott, Sean Murphy, Michael Gallagher, Michael McHugh.